ENTOUCH offers facilities professionals simplified energy and maintenance management for optimal budgeting, predictive planning, and increased efficiency. We’re here to empower you as the smart building expert as your guide to the connected enterprise. As a facilities manager you’re challenged to maintain day-to-day-operations with a focus on the end customer, all the while, managing utility costs, energy consumption, maintenance, equipment, vendors and employees. We know you’re stretched thin, that’s why we offer simplified facilities management. ENTOUCH provides the data and insights to track your entire portfolio of HVAC equipment across multiple locations with predictive analytics for proactive maintenance management. 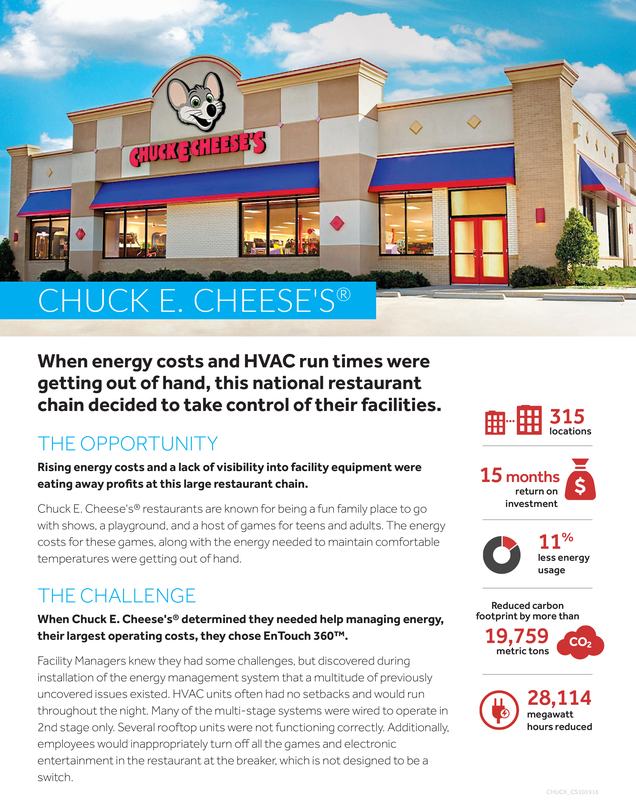 This is critical for facilities managers, who operate with limited budgets where HVAC accounts for approximately 40-50% of maintenance costs and 20% of capital spending. You have direct access to our dedicated team of account managers, who will act as an extension of your team to alert you of data inconsistencies and continuously optimize your energy management program reducing internal resource constraints. As your first line of defense, we help you trouble shoot issues on the fly for small repairs that would otherwise go undetected and eventually lead to equipment failure and expensive replacement costs. We’ll eliminate truck rolls from third party technicians significantly reducing maintenance costs. Leveraging our predictive maintenance tools, you can better plan for equipment updates, repairs, and replacements to meet your internal requirements for budget approvals.